Student activities—including games, role plays, group discussions, art projects, and language arts exercises—affirm the importance of respect, listening, and kind actions at school. Kids learn skills they can use to calm down and conflict resolution techniques for situations when strong emotions threaten to disrupt the peace. 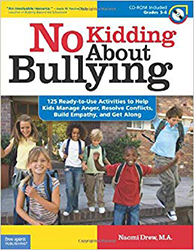 With a focus on preventing teasing, name-calling, fighting, exclusion, and other hurtful actions, No Kidding About Bullying also features activities for when mistreatment is occurring. A CD-ROM includes all of the reproducible handouts from the book.